A more modern implementation of the original at an affordable price, and currently standard issue on many U.K. amps. Very durable and consistent, which is good for manufacturing, but the distortion can be slightly harsh, and it lacks a little high end. This makes it more forgiving, but can sound a little dull. 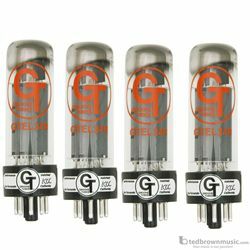 Groove Tubes have been trusted and demanded by touring professionals and their techs around the world. Groove Tubes started in southern California, and through innovative design, rigorous selection and testing, GT-powered amps have rocked the world in some of the most famous rigs ever played from studio to stage. Combining our passion for music with the science of sound, the Groove Tubes team still employs the same testing, grading and matching disciplines that continue to deliver flawless performance every time.